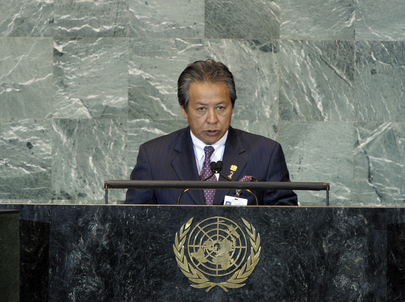 DATO SRI ANIFAH AMAN, Minister of Foreign Affairs of Malaysia, said that in a turbulent neighbourhood, mediation was the only answer for people to live in peace and security. “Through mediation, we can determine what the security concerns of people are and take appropriate measures,” he said, recalling that year after year, there had been hope for a peaceful and just resolution to the Palestinian issue. Patience and prudence had their merits, but they must not result in paralysis. “We must act,” he said, stressing that Malaysia supported Palestine’s bid for statehood and full United Nations membership. Urging strengthened resolve to eradicate terrorism in all its forms and manifestations, he said its root causes must be tackled. The hearts and minds of people must be won, but that was only half of the “battle of perceptions”. The other half involved combating the expression of extremist sentiments, including “Islamophobia” and attempts to demonize Islam or link it with terrorism. The real issue was not between Muslims and non-Muslims, but between moderates and extremists in all religions. “We must ensure that the voices of moderation, which currently constitute the silent majority, prevail over that of extremism,” he said. The Association of Southeast Asian Nations (ASEAN) had endorsed the “movement of the moderates”, whose work Malaysia would ensure complemented the Alliance of Civilizations. In other areas, he noted that Malaysia had pledged $1 million to the Organization of the Islamic Conference (OIC) Trust Fund on Somalia and dispatched a humanitarian mission to help Somalis. In the field of the environment, there was a lack of political will to implement good plans and Malaysia was concerned at the paralyzing differences in the institutional framework for sustainable development. The failure of the Commission on Sustainable Development to deliver a successful outcome last May spoke to that point, as did the unwillingness to honour United Nations Framework Convention on Climate Change commitments. The principle of common but differentiated responsibility must be coupled with that of historic duty in all climate negotiations. If institutional frameworks could not meet the daunting environmental challenges ahead, new mechanisms that were inclusive might need to be explored. On nuclear issues, he said Malaysia would continue to advocate for the total elimination of nuclear weapons by supporting a nuclear weapons convention, an issue which required starting multilateral negotiations, and he called on nuclear Powers to show good faith in that regard. On economic issues, he called for a new financial architecture that was transparent, equitable and representational, saying lessons could be learned from developing economies that had strengthened their financial institutions following the Asian financial crisis. For its part, Malaysia, under its “One Malaysia” concept, had launched various reforms, especially vis-à-vis its internal security and emergency laws. The Internal Security Act would be repealed and replaced by legislation to prevent subversive action, terrorism and organized violence. As for the United Nations, he said the Security Council should be reformed into a more legitimate, representative and transparent body that was accountable to the larger membership. Urging that mediation be used in the search for peace, he said States should also adopt the principles of transformation and moderation. Together they would comprise a “winning formula” for reaching world peace.